Authorized by Hanban, HSK Standard Course is developed under the joint efforts of Beijing Language and Culture University Press and Chinese Testing International (CTI). With HSK test papers as its primary source, HSK Standard Course is characterized by a humorous style, familiar topics and a scientific course design. Matching the HSK test in all aspects, from the content, form to the levels, it is a series of new-type course books embodying the idea of 'combining testing and teaching, and promoting learning and teaching by testing'. It is suitable for the Confucius Institutes in different countries as well as other Chinese teaching institutions and self-taught learners. The whole series is divided into six levels matching the HSK test, with one volume for each of Levels 1-3 and two volumes for each of Levels 4-6, totaling nine volumes. With a textbook, a workbook and a teacher?s book in each volume, there are altogether 27 books. 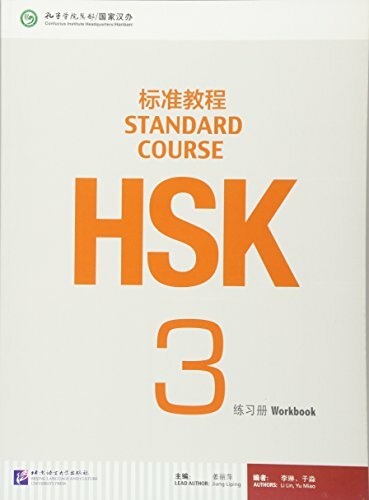 This is the workbook of HSK Standard Course 3, including exercises for each of the 20 lessons in the textbook, one HSK Level 3 model test, and an introduction to the HSK Level 3 test. This book can help students succeed in the HSK Level 3 test and all-roundly improve their Chinese competence and proficiency. The workbook is illustrated with plenty of photos matching the style of the test. An MP3 CD comes with the book. To be used together with HSK Standard Course 3 Textbook (ISBN: 9787561938188 ). Authorized by Hanban, HSK Standard Course is developed under the joint efforts of Beijing Language and Culture University Press and Chinese Testing International (CTI). With HSK test papers as its primary source, HSK Standard Course is characterized by a humorous style, familiar topics and a scientific course design. Matching the HSK test in all aspects, from the content, form to the levels, it is a series of new-type course books embodying the idea of "combining testing and teaching, and promoting learning and teaching by testing". It is suitable for the Confucius Institutes in different countries as well as other Chinese teaching institutions and self-taught learners. The whole series is divided into six levels matching the HSK test, with one volume for each of Levels 1-3 and two volumes for each of Levels 4-6, totaling nine volumes. With a textbook, a workbook and a teacher s book in each volume, there are altogether 27 books. This is the workbook of HSK Standard Course 3, including exercises for each of the 20 lessons in the textbook, one HSK Level 3 model test, and an introduction to the HSK Level 3 test. This book can help students succeed in the HSK Level 3 test and all-roundly improve their Chinese competence and proficiency. The workbook is illustrated with plenty of photos matching the style of the test. 1 MP3-CD comes with the book.